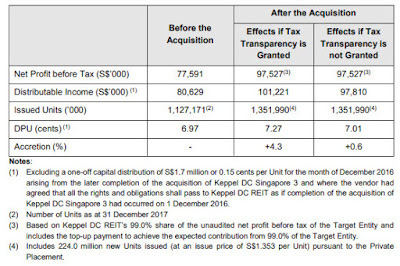 Keppel DC REIT requested for a trading halt earlier and launched a private placement of 224,000,000 shares at an issue price of $1.353 per share to raise gross proceeds of approximately $303.1 million. You can refer to the official announcement here. Let's look at the numbers! Long portfolio WALE provides income stability for the REIT (the longer the better) hence it is fairly conservative to assume DPU remain constant for this year as well. 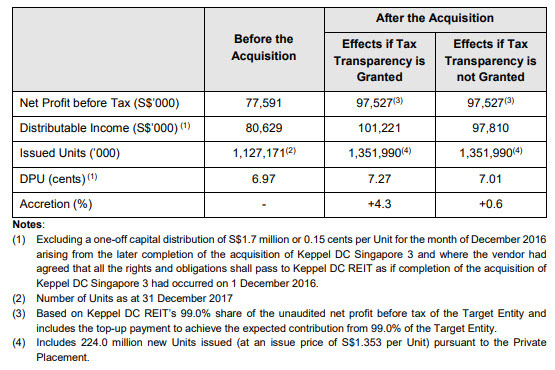 This is probably one of the reasons why Keppel DC REIT is trading at such a huge premium! Do note that the numbers are just estimated and the assumption is that the acquisition happened on 1st January 2017 and rental are collected for the FY2017. This is not a projection/promise for FY2018. 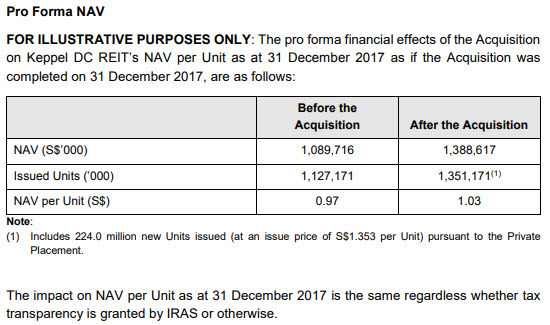 The NAV after the acquisition would be around $1.03. At the issue price of $1.353, the PB would be 1.31 which means I would be getting it at a premium of 31% instead of 47%! It seems that the DPU will be affected by some IRAS rules as well which I am clueless about but if you are interested, you can read about it here - Income Tax Treatment of Real Estate Investment Trusts and Approved Sub-Trusts. 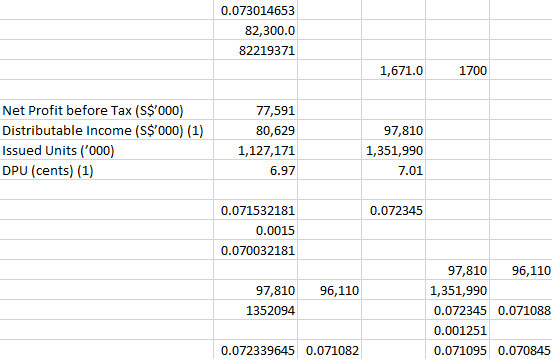 Given the above numbers, I will try to project a much more conservative yield I should be expecting by using the worst case scenario/numbers if I were to subscribe to the private placement. Weird. Now I am confused by the numbers, no matter how I calculate/reverse the computation, I cannot tie/tally the numbers... 97,810 / 1,351,990 != 7.01! Although it clearly states that the distributable income has already excluded the one-off capital distribution of $1.7 million. Now that I look closely at it, even 82,300 / 1,127,171 != 7.12. I guess I probably oversimplify the numbers and the only way to proceed is to use whatever number that was given. In addition, the gearing will improve to 32.1% from 37.4% which will give them more opportunity to acquire more assets and improve DPU in the future. As technology advances, data have become increasingly important for every business. Guess what would be needed to do that? lol. The numbers definitely look more decent as compared to buying it off the market. 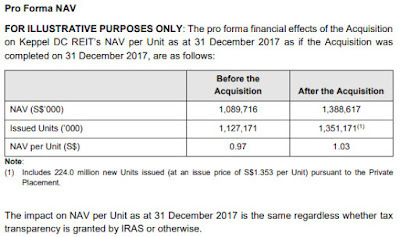 Another thing which I observe is that Keppel DC REIT declares distributions on a half-yearly basis (payment months are in February and August). This would be aligned with our DBS Multiplier strategy which I blogged about here - DBS Multiplier + SSBs + Joint Account = Higher Interest! With this REIT in our CDP, we can probably skip the SSB for August 2018. DBS and Citi are the bookrunners/underwriters. I guess all you need is a trading account with them? Honestly, I have no idea. This is the first time I was offered a private placement. I just started following up on this reit yesterday and then this happen. Surprise of the 5% yield which is much lower than CMT,FCT, Ascendas etc which I considered them to be stable too. CMT and FCT are retail REITs while Ascendas is industrial/business park. All are relatively stable but belong to different category with different characteristics. 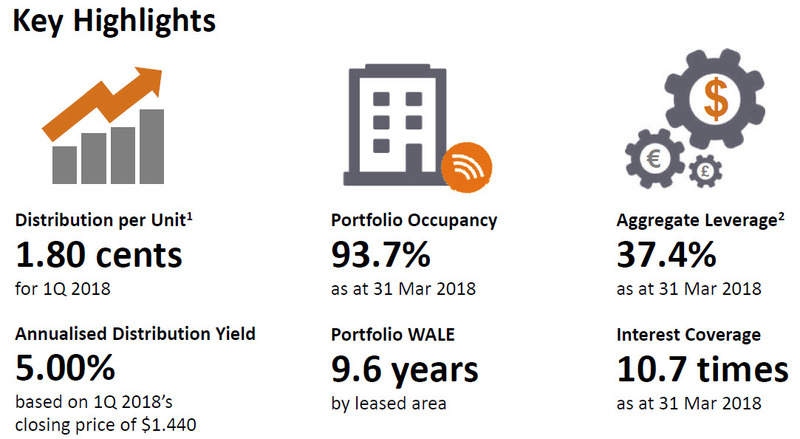 For instance, all the WALE are definitely much shorter as compared to Keppel DC REIT. Yield is just one of the numbers, there is the possibility of capital growth/loss too.